Pa Sak Ngam Waterfall Moo 1, Pa Sak Ngam, Doi Saket, Chiang Mai. And Ephes Classified as a source of natural recreation. And a tourist center. Unique features include wet mixed deciduous forest along the river. The waterfall is located in a valley between scenic spots. And the route between the village and go across Mae Kuang Dam to Lueung Nua Municipality. High slope of 70% of area. 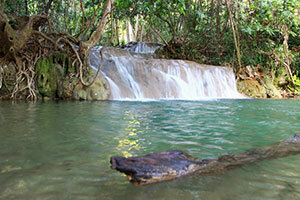 There are natural forests with waterfalls that are still intact. The recreational activities found in the area include water activities during the summer season (March-May). Travel You can walk to visit the village of wild beauty has two ways. It is about 30 minutes by boat to Mae Kwoang Dam. Another way to use a vehicle is a distance of about 90 km. Travel approximately 2 hours by Chiang Mai - Phrao.